Mötsenböcker’s Lift Off from Stoner—Sticker, Tape, and Adhesive Remover is patented with Mötsenböcker’s Lift Off formula for fast and easy removal of bumper stickers, stickers, pinstriping, spray adhesives, labels, tar, sap, chewing gum, and other sticky residue from vehicles, boats, RVs, fiberglass, metal, tile, vinyl, plastic, glass, brick, and concrete. The molecular bond of the adhesive is broken up quickly and safely. 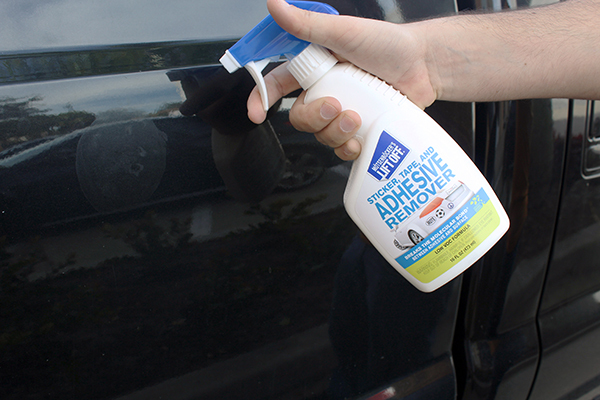 Sticker, Tape, and Adhesive Remover is the safer way to removing adhesives from your vehicle or surfaces. Mötsenböcker’s Lift Off formula has a low VOC, leaving out the harsh chemicals that are harmful to you and the environment. Easily removes stickers and other adhesives! To use, spray around adhesive edges thoroughly with Sticker, Tape, and Adhesive Remover and let sit for at least 60 seconds. Use a plastic scraper to lift off adhesive without scratching surface. Repeat if necessary. Wipe off completely. Rinse with clean water.